Hey, thanks for the answer about my palm muting problem. But there's another one thing that I'm never sure about, and that's pick angle. Should I keep it totally perpendicular when looking to the strings from above and should I turn it downwards e.g. when looking at it from the sitting/playing position? How hard should I pick? How loud should a note be? These are things that if I could clear up, I could be a much smoother player. Bence, the questions you ask about pick angle and attack can only be answered subjectively. I personally tend to use this when only down picking is being used, for a punchier attack. This is because the edge of the pick scrapes slightly across the string. I tend to use this pick angle when using faster alternate picking, as there's less obstruction due to less of the pick's surface area hitting the string. 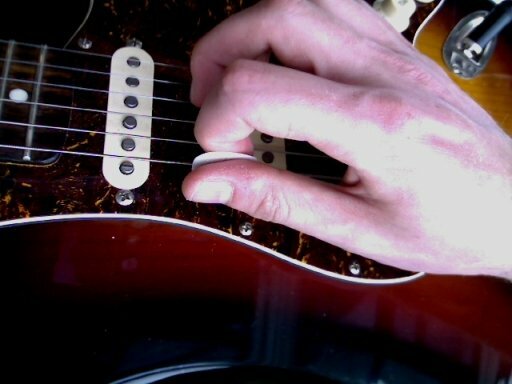 Remember that where you position your pick hand - towards the bridge or neck - also effects how fat or sharp the tone is. So it's all very subjective (i.e. there is no right or wrong way) and you should experiment with different positions in different playing situations to find the tone you want. The same applies to how hard/loud you pick. This is about dynamics and plays a large part in note accenting. 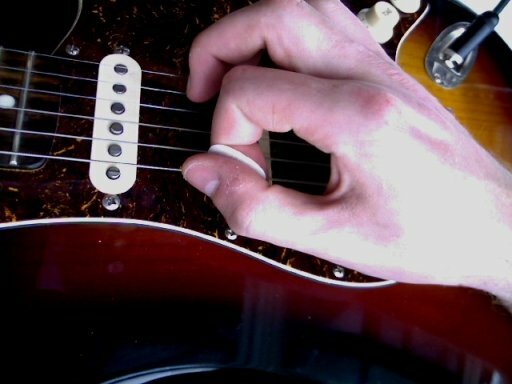 Some notes you'll want to accent more than others, so a harder pick stroke will help achieve this. It'll vary lick to lick, so you need to spend time playing with pick attack, volume, tone as you write your own riffs and phrases etc. The most effective way to do this is to repeat licks and phrases and try different accent notes. Listen to riffs and solos and try replicating how the guitarist uses dynamics, tone and attack to create the sound they do. You will then get a better idea of how using different pick angles and hard/soft picking create particular sounds. But ultimately, when it comes to your music, the pick angles and dynamics you use depends on the sound you want to create. The challenge for you is to practice playing smoothly no matter how you're picking, and any experienced guitarist will tell you that the quickest and most effective way to achieve this is to use a metronome, start slow and speed up gradually. When starting slow, focus on your tone (pick angle/position) and picking dynamics (hard/soft) and keep it with you as you speed up and gain confidence with the lick/phrase in question. That's really the only way to develop smooth, fluid picking while at the same time keeping your playing dynamic and respectful of how you want to express each note. Sorry I can't be more specific, but it wouldn't be right for me to say "play this way" because only you can decide what sound you want at any given time and that's an integral part of your personal development as a guitarist. After long trial & error sessions I roughly guessed the importance of Picking angle & dynamics. If I read you suggestion in the beginning then it would have been easier. Still you suggestion smoothed out my rough edges. My sincere thanks for sharing your knowledge.